to your Address Book or Safe Senders List. To view this email in your web browser, click here. View mobile version. *Free standard shipping will be applied to your merchandise total of $40 or more, per recipient, before shipping and/or tax. To redeem this offer, you must enter code SHOP4POP at checkout. Additional fees apply for 2nd Day, Overnight, and Saturday Delivery. 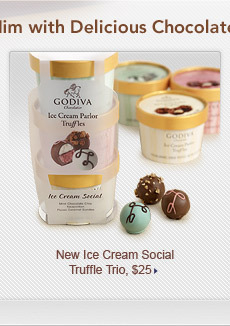 Offer valid in US only on orders placed on Godiva.com through 6/14/10, 11:00PM ET. Not valid in Godiva Boutiques, department/specialty stores, or through 1-800-9GODIVA. Not valid on orders over $300. Not valid on previous purchases, and cannot be combined with volume discounts or other promotions or offers. Not redeemable for cash. **15% savings will be applied to your merchandise total of $200 or more on qualifying items, before shipping and/or tax. To redeem you must enter code PARTY at checkout. 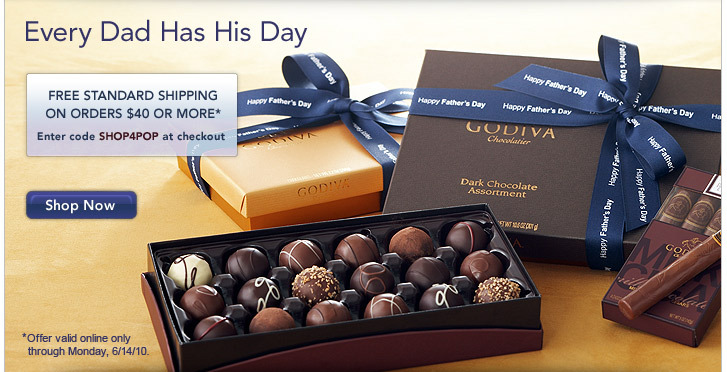 Offer valid in US only on orders placed on Godiva.com through 7/31/10, 11:00PM ET. 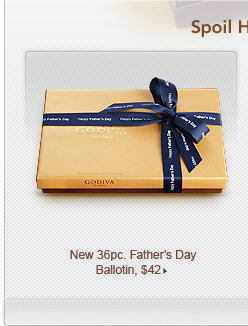 Not valid in Godiva Boutiques, department/specialty stores, or through 1-800-9GODIVA. Not valid on previous purchases, and cannot be combined with volume discounts or other promotions or offers. Not redeemable for cash. about new products, events, special offers and promotions. 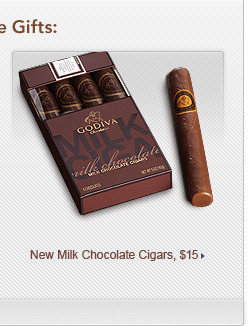 © 2010 Godiva Chocolatier, Inc. 139 Mill Rock Road East, Suite 2, Old Saybrook, CT 06475. All rights reserved.